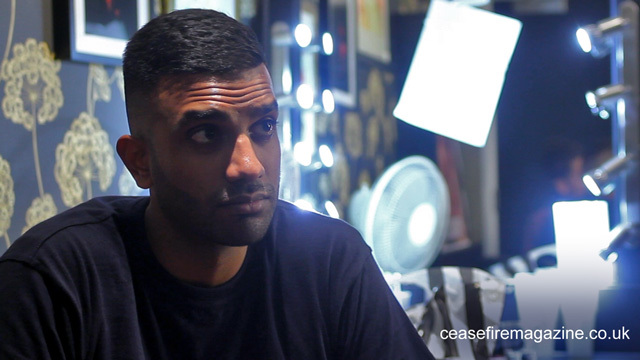 Over the past few years, Aamer Rahman has gained a reputation as one of the sharpest and most politically outspoken comedians working today, He spoke to Ceasefire while on his recent UK tour. It isn’t often that a ‘foreign’ comedian, with almost no television or film exposure here in the UK, can sell out consecutive nights in London’s acclaimed Soho Theatre. Even rarer is a comedian who is unstinting in his commitment to address themes and issues important to black and brown audiences that share his experiences, rather than pander to the sensibilities and expectations of white audiences, despite the latter being the primary fanbase of any comedian seeking mass appeal. Aamer Rahman is both of these things, and more. During his brief trip to the UK, he contributed to radical political events in the capital and received a four star-review from The Guardian, which apparently led to the number of white audience members at his shows to shoot up considerably. Confronting the politics of race and imperialism head-on, he remains unapologetic in his criticisms of governments in Europe, Australia and the US. In an environment in which Muslims in particular are the target of demonisation from the media and criminalisation by the state, Aamer boldly ridicules NATO, Israel, numerous Western governments and Anglo-American pop-cultural icons. Ceasefire caught up with Aamer Rahman in his dressing room before one of his London shows. Adam Elliott-Cooper, a writer and activist, is Associate Editor of Ceasefire and a doctoral researcher at the University of Oxford. His column on race politics appears twice a month. He tweets at @adamec87. Respectfully,stephen whale, i would disagree. Australia maintains this sort of national facade of multiculturalism and racial equality while at the same time advocating for racist policy. Australia has a horrible history of racism, from it’s colonial conception in 1788 and the murder of indigenous australians, to events like the Cronulla riots, racist attacks on indians, our treatment of asylum seekers and refugees (mandatory detention centers and offshore processing which has now devolved into complete refusal to accept refugees), and the continual abuse of indigenous rights (the northern territory intervention). This is ongoing, and as part of mainstream white dominant culture much of our interactions with marginalised groups is sort of this debased “you against me”, “white civilization against brown anarchy” sort of thing which is used to consolidate national identity against the “foreign illegal muslim terrorist asylum seekers.” The terrible Other. We see reflections of this in the underlying conservative rhetoric present in all the media we consume and which I see kids in my class echo these ideas back at me. As a muslim teenager growing up I see discrimination everyday. Racism in Australia is not just minority groups and it’s a far cry from being over. I guess i’m trying to say I think its very easy to hold this perspective when you come from a white middle class background – the dominant culture here, but as part of the alienated Other this is something you experience very regularly. Aamer’s words a very accurate reflection of current Australian society. Does he hate white people? Yes or no.